There's always a danger when watching truly iconic horror films for the first time, or indeed iconic films of any genre. The weight of expectation can sometimes be too much or the ubiquitousness of the film's imagery can prevent any of its scares from carrying the same weight as they would unseen. 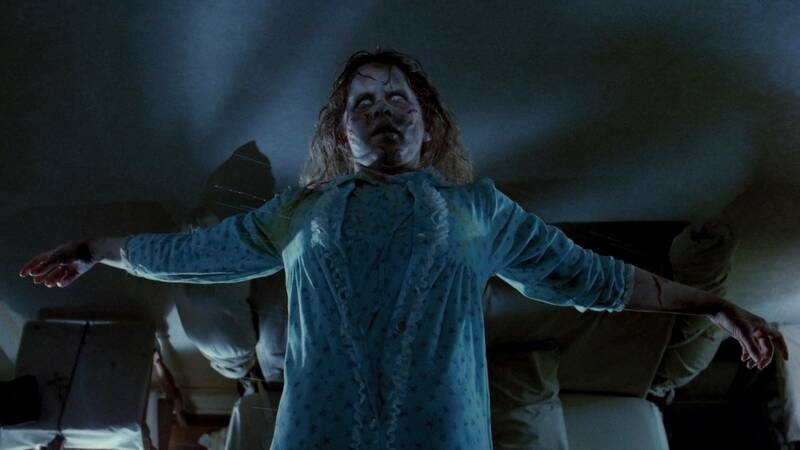 It's part of the reason why it took me so long to get to The Exorcist; from the instantly recognisable use of Tubular Bells to Linda Blair's battered face via pea soup vomit and liberal use of foul language, I felt I knew too much. I like films to be a surprise, an unknown quantity that is allowed to unfold as its creators intended, but in some cases, it's just not possible. I needn't have worried here though. It turns out I didn't really know anything about The Exorcist at all. The biggest surprise? The exorcism itself takes up very little of the narrative. Instead, it's a melancholic exploration of faith in its various forms and the horror that arises when this faith is called into question. Naturally, religious faith is at the forefront, captured in the contradictory, troubled figure of Father Damian Karras. The embodiment of the clash between modern science and old Catholicism, Karras is the brain of the film, questioning everything around him through the lens of his psychological learning yet unable to reconcile that with his faith. It's also coloured by his own still raw grief at the death of his mother, something which he was neither there for nor had the ability to prevent. His work with Regan becomes an act of redemption almost, a seizing of control at a time in which he feels he's lost it entirely. This lack of control is a running theme throughout the film, most obviously in the possession itself, but also in the circumstances that surround it as Chris tries to help her daughter. The MacNeils' most horrific experiences aren't necessarily the possession scenes, but the medical procedures she is forced to undergo as a world of science attempts to apply a rational diagnosis on an irrational occurrence. Anyone who has been through the illness of a loved one instantly understands the frustration felt by Regan's mother, Chris, unable to protect her family and surrounded by people who don't appear to know what they're dealing with. It's a form of emotional torture, a visceral pain that the film continues to capture in various ways. Weaving these two stories together, a mother trying not to lose her child and a man mourning the death of his own mother, gives The Exorcist an emotional core that so many quickfire horrors tend to forget. In order to truly feel the scares and empathise with their plight, we need to care about these characters and Friedkin takes his time to slowly build their world and their relationships. It helps that this lack of control is something every one of us has experienced, but dialled up to such heightened proportions that it taps into our worst fears without us ever really realising it. Karras' grief or Chris' frustration are entirely within the realms of human experience, but dealing with something inhuman and unknowable as a result. Perhaps the other big surprise was how well the representations of that inhumanity in the film's special effects have held up over the years. The practical effects are still pretty much seamless; unlike say, the staircase fall in Psycho, nothing works to remove you from the proceedings, only enhance that raw quality the film possesses. Mercedes McCambridge's vocal work as the demon Pazuzu is excellent, often feeling like the human voice equivalent of nails scraping down a chalkboard and even those iconic moments carry a certain power that I never expected to experience. The tension is mounted so expertly throughout these scenes that the exorcism's final moments feel like huge, emotional release. It's such a great feeling when you finally get to a film like The Exorcist and it still manages to defy your already high expectations. With an intense exploration of faith at its heart and some wickedly effective make-up, the film still has the power to shock.